‘Good things come to those who wait’ commented race officer Kathy Smalley at the prizegiving of day one of the 2014 Garmin Hamble Winter Series. That was certainly the case out on the water. Despite a two hour postponement to await the breeze, the race team remained confident that enough wind would fill in, despite the evidence from a nearby scrap metal yard fire, from which the smoke rose in a perfectly straight column. But sure enough, at 1230 a gentle 6-8 knots from the SE ghosted in, allowing all classes to fit in a race in blazing sunshine. Combined starts got the fleet away in double-time to make the most of the fickle breeze. First to start, with an individual recall, was IRC 0. Niklaas Zennstrom’s Farr 45 Kolga finished 1st on corrected time, only one second ahead of Chris Body’s J/111, Icarus. Fellow J/111, JElvis, finished third. In IRC 1, Tim Octon’s Corby 35 Doyle Sails finished three minutes ahead of second placed Xinska to take the top spot, while in IRC 2, HOD35 Malice topped the podium, ahead of the J/88 Eat Sleep J Repeat and First 35 Hot Rats. IRC 3’s start was combined with the Sigma 38s. J/97s dominated the podium, with Andy Howe’s Blackjack II ahead of Charles Ivill’s ‘ETB Tyres Just Like That in second. John Noe’s X-332 La Nef IV was third. 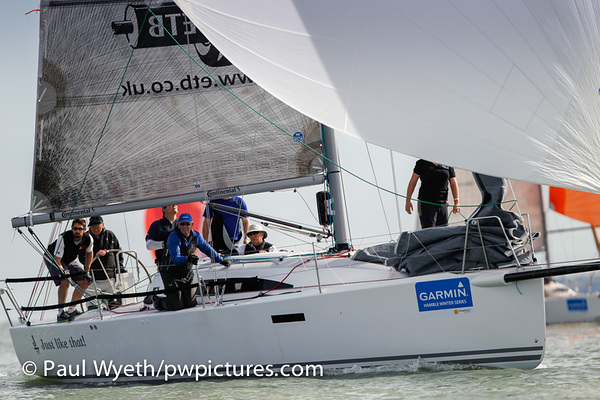 The Sigma 38s were topped by Nigel Goodhew’s Persephone, with Chris and Vanessa Choules’ With Alacrity in second and Rob Lee’s Kindred Spirit in third. IRC 4 might have the smallest boats in the fleet but it also boasted the largest entry with 14 boats, 7 of which were Impala 28s. Quarter tonner Flashheart finished first on the water and overall, 30 seconds ahead of Impala Polly on corrected time. Mustang 30 Erik the Red was 3rd. 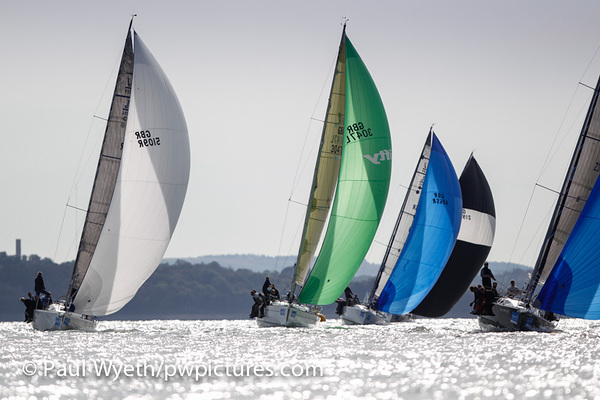 The weekend also hosted the first of two Doyle Sails Hamble One Design Championships weekends, with racing for SBR, SB20, J/70 and J/80 classes, as well as J/109s. As on Sunday, Saturday’s start was postponed – but this time due to too much wind. Once the front had blown through and the cold rain had stopped falling, all classes had a storming sail, fitting in 3 races in the sunshine. In the J/109s, Jubilee, Designstar 2 and Tigh Solius won a race apiece, sharing the podium in each race. In the J/70 class, David Atkinson’s Jawbreaker scored two firsts and a third to lead the class after one day, four points clear of Paul Molesworth’s JustNow. In the J/80 class it was Phil Taylor’s J.A.T that topped the podium with three bullets, ahead of Douglas Struth’s DSP and Jon Powell’s Betty, in second and third respectively, with equal points. In the SB20s, things were close at the top, with Marshall King’s Spongebob ending Saturday one point ahead of Sportsboatworld.com in second and Chill Pill in third. 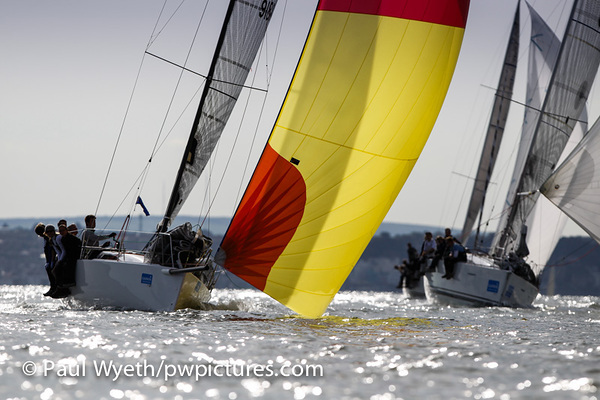 There wasn’t enough wind on the White Fleet race area on Sunday to fit in any racing, so competitors await the second Doyle Sails Hamble One Design championships weekend in a fortnight’s time to determine the final results for the 2014 event. Day Sponsor was Hudson Wight, who provided £50 off vouchers to class winners, and a pair of gloves to second placed boats at a packed prizegiving in the HRSC clubhouse, where plentiful supplies of hot food and a packed bar were available. Next weekend sees the first of two MDL Hamble Big Boat Series weekends, as well as the second Garmin Hamble Winter Series race day, where the day sponsor is the Bugle pub. See you all on the water – and if you haven’t yet entered, it’s not too late to come along – just contact the club office!